Who is eligible for programs at The Sajni Center? Programs at The Sajni Center are open to families, regardless of income, who have children from birth to age 21 who have a life-threatening illness or chronic physical health condition not developmental in nature. Some of these diagnoses include: cancer, cystic fibrosis, sickle cell, epilepsy, diabetes, asthma, spina bifida, heart conditions, and severe depression. Please reach out to us if you have questions about whether or not a family may be eligible so we can learn more! Are siblings/parents invited to programs? Does my child need to be in active treatment for his/her life-threatening illness in order to be eligible? Your child does not need to be in active treatment to participate in programs at The Sajni Center. How does a family sign up for programs? We must first receive a short form from each family, which can be completed online at lucyslovebus.org/sajnicode. When we receive that form, we will email the family with a special code that can be used to register for any program. Please note that you must register for ALL programs in advance; we are unable to accommodate walk-ins at this time, as some programs have a maximum number of participants. Are programs available for bereaved families? Yes, we have specific bereavement programs such as Yoga for the Tender-Hearted, but bereaved families who lost a child/sibling to life-threatening illness are welcome to join us at any of our programs. These families are still asked to fill out the short form to receive the code and registration information, available at lucyslovebus.org/sajnicode. Can I walk-in to programs? At this time, advanced registration is required. We will cancel programs if there are not sign-ups by noon on Friday, so please check our calendar to see if a program has already been cancelled if you are considering joining us that day but have not registered yet. We will have a staff member and/or volunteer available with activities (games, books, crafts) in an adjacent room to watch younger children or those not participating during programs. If your child requires additional support/care, please let us know in advance as we may ask that you arrange other childcare if we feel we cannot comfortably support your child depending on his/her needs. What if my child or family member is sick? If you or anyone in your family who is planning to attend programs is feeling ill, has recently been vaccinated, or has been exposed to chicken pox, we ask that you do not attend the programs. We serve a medically fragile and diverse population and for everyone's safety and comfort, we ask that you not expose others to any sort of virus or illness. If your child is immunocompromised but would like to attend programs, please let us know ahead of time so we can let you know if we'd be able to accommodate your family in a separate area. Programs are $5/person, but we have scholarships available for families who need them. How do I see a schedule of programs? Visit lucyslovebus.org/calendar for our event calendar, or lucyslovebus.org/sajniprograms for a list of program descriptions and dates. Once we receive a family's form, we will also add them to our text blast and email blast which is sent out early each week with that weekend's programs. All programs (unless otherwise noted) take place at The Sajni Center, located at 21 Water Street, 3rd Floor, Amesbury MA 01913. Located in downtown Amesbury, minutes from 95 and 495, in a fully accessible space with lots of free parking in lots across the street! Our Adventure Gang support group will take place at Three Hearts Farm for the summer (August and September), located in West Newbury. 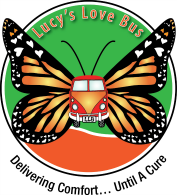 If you have additional questions, please contact us at info@lucyslovebus.org or 857-277-1984. For questions about Lucy's Children™ program (individual funding for integrative therapies for children with a cancer diagnosis only) please click here.